New genetic evidence shows our ancestors interbred with now-extinct species. Visitors of the Museum for Prehistory in Eyzies-de-Tayac looking at a Neanderthal man ancestor’s reconstruction. Photo by Patrcik Bernard/AFP/Getty Images. I quickly logged in and clicked on a heading called My Ancestry. I found pretty much what I expected: I’m 100 percent European, albeit descended from an ancient group that once lived in a place that no longer exists—Doggerland, now flooded by the North Sea. But much to my surprise, I also learned there was a Neanderthal in my family tree. A box on my ancestry page said: “You have an estimated 2.9 percent Neanderthal DNA, which puts you in the 89th percentile among Northern European 23andMe members.” I immediately compared genetic notes with my husband, who suggested I declare my Neanderthal heritage as a potential conflict of interest when I write about Neanderthals (so noted). That was probably just sour grapes because he found out he has less Neanderthal DNA than I do—just 2.6 percent of his genome. What amazed me most, though, was how easy it was to connect with my inner Neanderthal. This mail-order analysis brought home just how much things have changed recently in our view of the origin of our own species, Homo sapiens, and our relationship with Neanderthals and other archaic humans that we didn’t even know existed. Major breakthroughs in the past five years in the way scientists extract and analyze ancient DNA have given researchers a whole new way to look back in time. They are using DNA to trace the evolution of modern humans and archaic species. One thing has become perfectly clear: Our ancestors were seldom, if ever, alone on Earth. New fossils and genetic studies show that our direct ancestors shared the planet with at least one other type of hominin from shortly after the time our taxa split from the chimpanzee and bonobo lineage roughly 6 million years ago until a Hobbit-size human called Homo floresiensis went extinct on the island of Flores in Indonesia just 17,000 years ago or so. And it’s clear that they knew about each other, because we carry traces of some of those other kinds of humans in our DNA today. The most stunning revelation has been in how we view our relationship with our close cousins, the Neanderthals. Ever since the discovery of the skull of an archaic human in 1856 in a cave in Germany’s Neander Valley, researchers have wondered how Neanderthals were related to us. For most of the 20th century, most scientists thought Neanderthals were our direct ancestors, one step ahead of us on what was often seen as a single, ladder-like line leading from primates to modern humans. But when researchers re-dated key fossil sites in the Qafzeh and Skhul caves in Israel in the 1980s and 1990s, they found that fossils of early Homo sapiens were 80,000 to 120,000 years old—older than the 40,000-to-60,000-year-old Neanderthal fossils in the same caves or nearby. This made it pretty clear that Neanderthals didn’t give rise to modern humans and showed they probably were contemporaries of our ancestors. We also know from fossils that modern humans arose in Africa 200,000 years ago or so and that Neanderthals lived in Europe starting at least 300,000 to 600,000 years ago and went extinct about 30,000 years ago. By the end of the 1990s, most paleoanthropologists favored the “out of Africa” model for modern human origins, which proposed that sometime in the past 100,000 years, Homo sapiens came out of Africa, spread around the world, and replaced Neanderthals and any other archaic humans they met in Asia and Europe, perhaps by giving them a deadly virus or by outcompeting them for food and other resources. (These archaic people were separate species, descendants of Homo erectus, the first human ancestor to leave Africa. H. erectus first migrated to Asia about 1.8 million years ago.) This view was bolstered by evidence from fossils and stone tools as well as initial studies of DNA from the mitochondria of the cell (mtDNA), which is inherited only from one’s mother and can be used to trace maternal lineages. Analysis of mtDNA from Neanderthals found no evidence that they interbred with modern humans. A few researchers still favored the competing model, called “multiregional continuity,” which held that early modern humans, Neanderthals, and other archaic people all belonged to a single, worldwide species of human that evolved slowly over time, with these different populations mixing and mating over time to produce Homo sapiens. 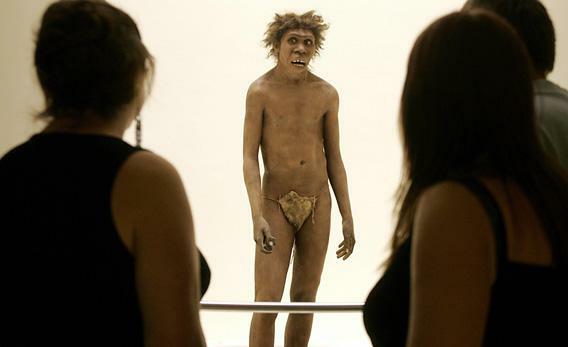 All that changed in May 2010, when researchers were able to get enough nuclear DNA from three female Neanderthals who lived in a cave in Croatia 38,000 to 44,000 years ago to splice together and publish the first draft of a Neanderthal genome. When they compared that draft genome with DNA from modern humans in Europe, Asia, and Africa, paleogeneticist Svante Pääbo of the Max Planck Institute for Evolutionary Anthropology in Leipzig, Germany, and his colleagues found that modern Europeans and Asians—but not Africans—have inherited between 1 percent and 4 percent of their genes from Neanderthals. They proposed that we inherited this DNA from a few close encounters between our ancestors and Neanderthals, perhaps after modern humans swept out of Africa and into the Middle East but before they spread into Europe and the rest of Asia. This was not wholesale intermingling—nor was it classic multiregional continuity—but low-level interbreeding, they said. Either our ancestors had just a few hookups, perhaps as the first waves of modern humans moved into Neanderthal territory. Or, the two groups were well on their way to becoming separate species and, thus, were biologically incompatible and able to produce few offspring that survived and were fertile. Just seven months later, the story got even more complicated, with a new character emerging from Siberia, of all places. Pääbo’s group published the nuclear genome of a new kind of archaic human from Denisova Cave in the Altai Mountains of Russia. The researchers had extracted remarkably well-preserved DNA from a tiny sliver of finger bone from a girl who lived in the cave more than 50,000 years ago. The DNA showed that she was neither a Neanderthal nor a modern human (although bones of both species have been found in the same cave at different times). She belonged to a new lineage called the Denisovans. Although only three fossils of Denisovans have been found so far (the finger bone and two molars in the same cave), the girl belonged to a group that left its mark on living people today in Southeast Asia. In follow-up studies, researchers identified people who had inherited about 3 percent of their DNA from the Denisovans, as well as 4 percent to 6 percent of their DNA from Neanderthals. These people are found in a patchwork quilt of populations on islands of Southeast Asia, including Melanesians in Papua New Guinea, aboriginals in Australia, and Negritos in the Philippines. Researchers are searching for new fossils of Denisovans in Asia. But for now, they’re in the curious position of having a genome in search of a substantive fossil record of this new kind of human. Finding out the overall fraction of our DNA derived from Denisovans or Neanderthals is only the beginning. Researchers are trying to mine as much information as possible from the Neanderthal and Denisovan genomes to find out as much as they can about these archaic peoples’ identities—and what set them apart from us. In August, Pääbo announced in the journal Science that his group had sequenced the genome of the Denisovan girl 31 times over, using a new method to get as sharp a picture of this ancient genome as of a living person’s. The girl’s genome already has given researchers a better look at her: It reveals, for example, that her eyes, hair, and skin were brown. The research is also giving us a new way to know ourselves. By comparing the girl’s genome to those of living people and Neanderthals, researchers are producing a near-complete catalog of the small number of genetic changes that make us different today from Denisovans and Neanderthals. “This is the genetic recipe for being a modern human,” says Pääbo, whose team also is at work to produce a high-quality copy of the Neanderthal genome. Already, researchers have identified differences in genes associated with the wiring of the nervous system, including those involved in the growth of axons and dendrites—the threadlike branches of neurons that transmit signals and connect different parts of the brain. They’ve spotted differences in 34 genes associated with disease in humans, including autism and speech disorders. This doesn’t mean that Denisovans or Neanderthals had those disorders, but changes in those genes during our ancestors’ evolution led to variants that can cause disease. Soon we’ll be able to specify which parts of our own genes came from Neanderthals and Denisovans. At 23andMe, some customers already are downloading their DNA data and plugging it into search engines to identify which DNA markers they have inherited from Neanderthals—and discussing it on the Spittoon blog. It’s fun to speculate whether you inherited a version of a gene that gives you red hair or a pronounced brow ridge from a Neanderthal, but the quality of the genomic data for Neanderthals is not good enough yet for the comparisons to be reliable, says population geneticist Joanna Mountain, senior director of research at 23andMe. The Denisovan genome is of high enough quality, however, and it will be a short time before people like me can scan our own genomes data for specific Denisova markers. (Sadly, I’m unlikely to have any Denisovan DNA since my ancestors were not from Melanesia or island Southeast Asia—at least that I know of.) For now, I’m waiting for higher-quality data on the Neanderthal genome, which will be coming, according to Pääbo. In the meantime, we should think twice before we call people Neanderthals. They may not be as fortunate in their inheritance of such an ancient and distinguished bloodline.